Sale items, New Products, Most popular : Check this page to find quality items at temporarily reduced sale prices. Scroll down for some newer products. Your purchase favorite may be one of our Most Popular listed below. Featuring a quality selection of highly realistic artworks and collectable wildlife sculptures. Diminutive Tray Top Tea Table: The Diminutive Tray Top Tea Table (circa 1755), is unique not only for it's small size but also for the added drawer. The meticulous fan carving serves as a focal point. 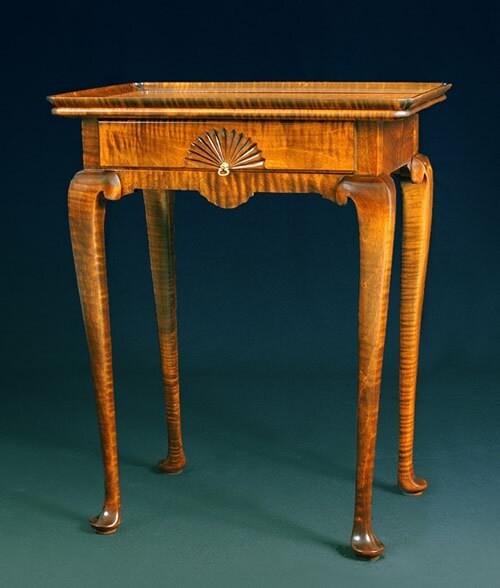 Using the adept American restraint in designing, this museum quality Tray Top Tea Table is fabricated using mortise and tenon construction on the frame with an applied concave molded tray top with notched corners, and dovetail construction on the drawer. Diminutive Tray Top Tea Table Dimension inches: 14 ½ deep, 21 ½ wide, 27 high. The cyma curved apron, contours into the cabriole legs, with padded feet, in the traditional Queen Anne fashion. The Diminutive Tray Top Tea Table replication is available in solid American Curly Maple. This elegant table can be accented with a Decanter Chest with Inlaid Wood, or a Bombay Tea Caddy. Because of it's small size and versatility it displays well in any room. Gifts, ships, afd, sp, .. When purchasing, Please apply our order terms and any unique terms in each item's gallery.